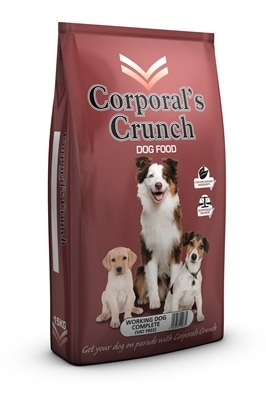 Corporal’s Crunch consists of a range of foods ideally suited to the needs of working dogs. The complete food providing the complete nutritional requirements for your dog and needs no supplements. The range of mixers has been developed to be mixed with either fresh or canned meat, providing an essential supplement to the working dog’s diet. This product can be fed dry or moistened with water or gravy to the consistency that your dog prefers. Typically a thorough mix of 2 parts warm water with 3 parts (dry weight) of food is preferred. The above amounts are only a guide and you should feed sufficient amounts to maintain condition, dependent upon the level of activity enjoyed and the conformation of your dog. Always ensure that clean, fresh drinking water is available at all times. There is no requirement to supplement this diet. Protein 20.0%, Fat Content 8.0%, Crude Fibres 3.0%, Crude Ash 9.0%, Moisture 10.0%, Metabolisable Energy 349 kcal/100g, Calcium 2.0%, Phosphorus 1.2%, Vitamin E 100mg/kg, Omega 6:3 Ratio 14:1. Cereals, Meat & Animal Derivatives, Oils & Fats, Derivatives of Vegetable Origin, Minerals. All mixes are complementary pet food for dogs and should be fed mixed with an equal amount in weight of fresh meat or canned dog meat. This guide is approximate. An individual dog’s requirements may differ depending on age, size and condition. Protein 10.5%, Fat Content 3.0%, Crude Fibre 2.0%, Crude Ash 4.5%. Cereals, Oils & Fats, Minerals.